A wave of stike action around the Ritzy Cinema in London shows a new generation discovering trade unionism for the modern age. On Thursday, London will see the first cinema workers demonstration. It is called by BECTU (Broadcasting Entertainment Cinematograph and Theatre Union) and spearheaded by the Ritzy Living Wage campaign. The protest will coincide with the tenth strike by the Ritzy union branch this year in a dispute which has seen them take centre stage in the living wage struggle. The Ritzy branch will be supported by workers from the sector: the British Film Institute and BFI Imax, Cineworld, Coronet, Curzon, Everyman, Odeon and Picturehouse cinemas. The majority of them are young, casualised, underemployed labour. They are discovering trade unionism for their generation. For all the scare talk of “union barons” and “questionable mandates” around the 12th July public sector strikes, you could not find a more bottom-up and genuine struggle. Only those who don’t know what it means to lose ten days pay when you are already on the breadline, can imagine that these are troops deployed at the wave of a union official’s hand. As for the mandate, at the end of June, Ritzy workers renewed their strike ballot with a 97% vote in favour. The cinema industry has been decimated by automation – the adoption of digital projection saw the haemorrhaging of highly skilled cinema projectionists. It is also one where screening schedules change weekly and the numbers of screenings ebb and flow to meet public demand. Employers pride themselves with providing flexibility - this translates into 0 hour contracts, chronic underemployment and large staff turnovers. The Ritzy branch have engaged in creative, noisy and colourful protests across London. Their protests visited other Picturehouse cinema branches, and have won the support of celebrities (like Eric Cantona, James Nesbitt, Clio Barnard, Mark Rylance, Irvine Welsh) and the steadfast local Brixton community. They have engaged audiences attending Picturehouse events which promote social justice (Amnesty International Football Film Festival and the Human Rights Film Festival) to point out the contrast between the company’s independent and progressive rhetoric and their imposition of poverty wages. At the same time, the campaign has kept pressure up through petitions and social media. 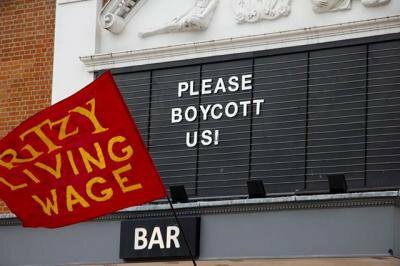 They have received help from a supporters’ group Cinema Workers’ Solidarity and the TUC has endorsed a boycott of Picturehouse Cinemas nationally. They have organised benefits and are still calling for donations which have been generous and have sustained the campaign. It is an example of what a popular, unswerving and creative trade union struggle looks like in the 21st century. The Ritzy campaign comes after the success of the Curzon Workers campaign to gain union recognition. In an industry which seems to have lost the plot, the workers find themselves successfully arguing the business case: concession price tickets are inclusive and will maintain a loyal audience, also increasing your profits. It is to their credit that the Curzon workers managed to reintroduce concession rates, but their demands for the Living Wage have not yet been met, even though the Curzon group opened a five-screen swish new cinema in Victoria (London). In the last few years, BECTU have secured a living wage for BBC Contractors, BFI IMAX, BFI Southbank (and amongst contractors engaged by the BFI), at ITV, the Royal Opera House and National Theatre. The union is also seeking to secure the London Living Wage for workers in West End theatres as part of the pay and conditions claim submitted last week. The living wage is not a London issue, even though it is in the capital that austerity policies, the stratospheric hikes in the housing market and public transport prices are the most damaging to working people. The Curzon workers are seeking contact with their colleagues in Ripon, Stafford and Knutsford and the chain is expanding to Canterbury, Colchester and Sheffield. Picturehouse Cinemas have a national spread as well. Those parts of the country which are suffering a shrinking job market is where employers’ rhetoric that a living wage is a privilege and not a fair share will be strongest. It will be up to organised workers to push the case for decent wages and proper contracts. And to back it up with strikes when they are not listened to. OurKingdom doesn’t have a billionaire proprietor telling us what to write - we rely on donations from readers like you. Please chip in if you can.